I've got the honor of painting up a squad of Assault Terminators and the Company Banner Bearer for the Command Squad for the Storm Wardens Collaborative Army. Here's a look at the super secret official color scheme. The Inheritors (what they call the Elite guys I believe) do wear Terminator Armour, and they are predominantly silver with blue on their boots/shins and hands. 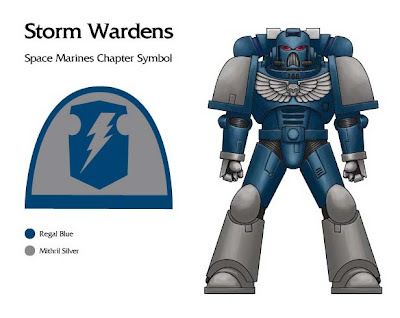 Thunder hammer/storm shield is favoured for Assault Terminators. Distinguishing personal affectations: Storm Wardens often carry a Sacris Claymore in place of a combat blade! They also like "tempest amulets" or charms, which are basically small lightning-shaped runes (not unlike those of Space Wolves) or charms that they attach to their wargear. Veterans usually have a silver helmet (similar to the Blood Angels vets with gold helmets). As you can see, I've got my color scheme laid out for me, my weapons picked out and an idea of what kind of elements to add to the models to give them that "Storm Warden" feel. Up next, I take a look at the models I've got and what I'm planning to do with them to make them work. Your terminator work is awesome, I can't wait to see what you do here. Yes folks, bid lots. I don't care that I won't win... let's just support a great cause! Looking forward to seeing the banner bearer - do you have a design for the banner worked out already? I am a total fan of all of you (Jawaballs, Dan and yourself), you've had a huge impact on my passion for painting. It goes without saying this project is ambitious and totally awesome. For the shirt, I think it'd be a great idea as well to make a shirt with only the storm warden's symbol on it. The one with the logo is alright, but I think a shirt with just the logo would sell really well. You could have the Crux with the Bolt (the symbol) and then bellow it, have written "Storm Warden's Collabritive Army Build" or something else, you could get real creative. The money gained from selling shirts could be then given to the cause as well. Interesting info there Ron, you'll clearly need to encoorporate a series of elements in your design process. But by the look of thing there will be enough room to give your own spin to them as well! Have fun and best of luck with the colourscheme, should be an interesting one! it's a cool colour scheme... buuut "predominantly silver with blue on their boots/shins and hands" - the pic you have there, isn't that predominantly blue with silver? Yes, which means what I'll be painting up won't match the picture up top. I'm surprised the Doctors without Boarders logo isn't a little more prominent in this give-away.